For Friday, June 1st, Peony Field Days will be open at Swenson Gardens from 9 am to 5 PM. Our address is 10958 70th St SW, Howard Lake, MN. 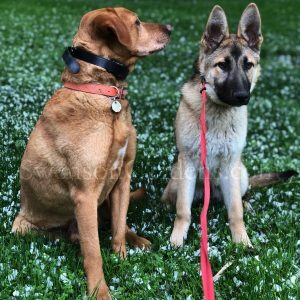 Parking is available on the east side of our driveway as you enter off of 70th St SW. Yes we do have a couple of mini-biffs onsite just as you enter the parking area. You will see a large, white canopy on the west side of the driveway so stop there before entering the fields for more information. For those of you who would like to enjoy our fields from a vehicle, you can drive all the way north past our home and there is a turn around circle. Please note that our driveway will barely fit two cars meeting so best to wait until the coast is clear upon heading south back down our driveway. 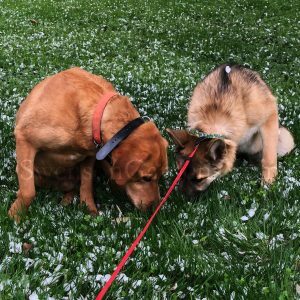 We are also a pet friendly farm so feel free to bring your four legged family member as long as they are always leashed and cleaned up after. As you can see in the picture above, Red Charm opened up today. Two of our fields on the west side of our driveway have early to mid varieties in prime bloom with some mids showing today as well. Color percentage is about 15 to 20% in these fields. 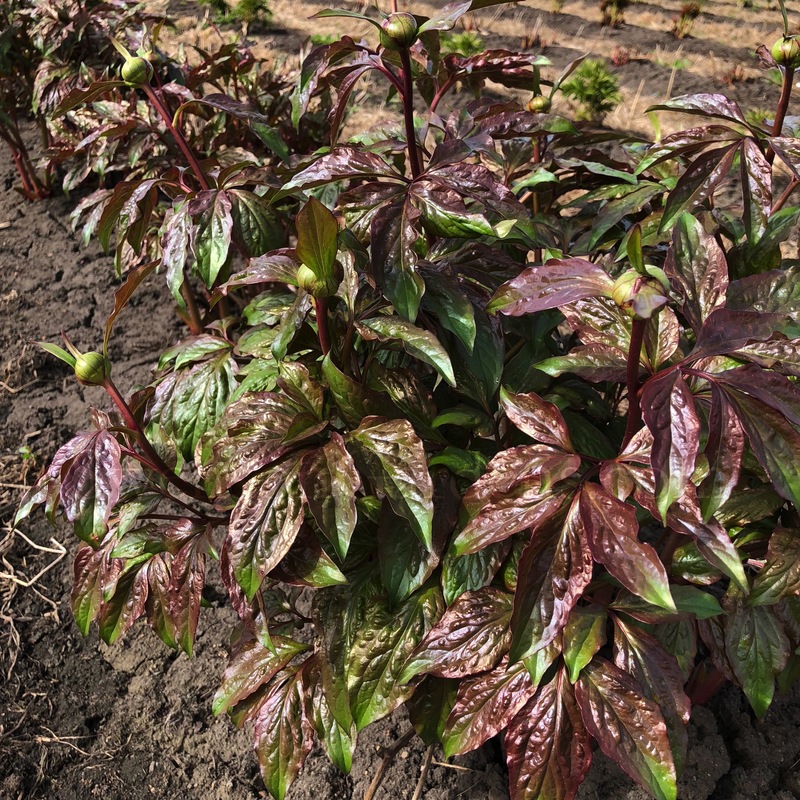 My guess is peak color in the fields a week from now but the joy of coming in the early to mid bloom stage is to see varieties that are normally done blooming like they were last year. 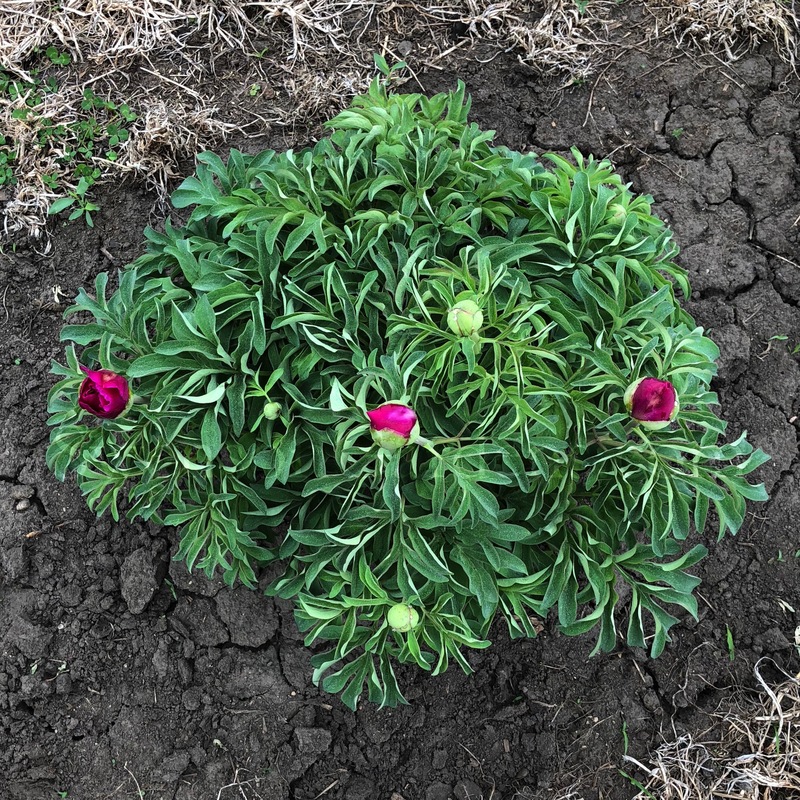 That is why we encourage our customers to order peonies that bloom at different times so you can enjoy about 7-weeks of color from very early to very late varieties. 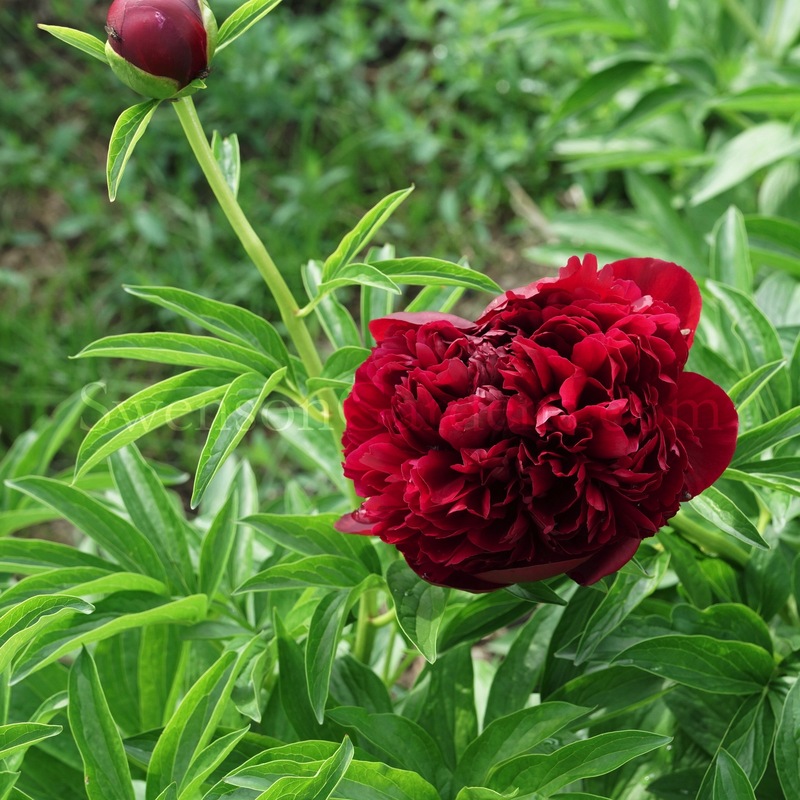 Also many of the intersectional hybrid peonies are showing color with their primary buds. Our north field is showing more color vs the south field by the canopy so it is well worth the 1/4 mile walk to the north field. Our field on the east side of our driveway is not showing any color yet next to our driveway as that is our micro-climate field with lower temperatures. Amazing the temperature difference as you walk between the south and north field. 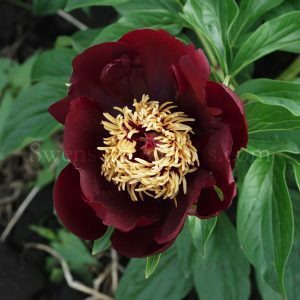 Peony Field Days is only in the fields south of our home so please respect that unless of course you wanted to watch all the Purple Martins flying around in the two houses next to our house. As far as field conditions, it is a tad muddy in some of the areas from the rain this week. You may want to bring some boots if your planning on coming on Friday. As far as the mosquitoes, so far so good with very few around as of now. 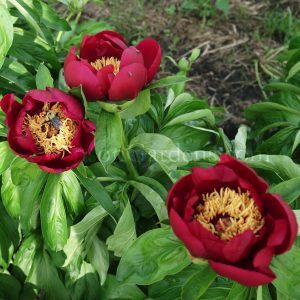 You will see a lot of honey bees around the blooming peonies so just let them do their work and they will not bother you. We are a honey bee safe farm and our hives are a distance away from our peony fields. Make sure to bring your cameras as being the largest chemical free peony grower in the world, butterflies, honey bees, hummingbirds and of course Purple Martins, love living here and present some amazing shots. We do have trumpeter swans stopping in almost daily on our pond so be ready with the telephoto lens if the shot presents itself. Those of you who will be ordering your bare-root peonies for pick up or delivery this fall, you will receive a variety listing upon your arrival at the information tent and then when you are finished strolling through the fields, stop back at the information area and someone will be available to answer any questions and be able to take your order. If you are paying with a check or cash, there is a 7% product discount vs full price when paying with a credit card. 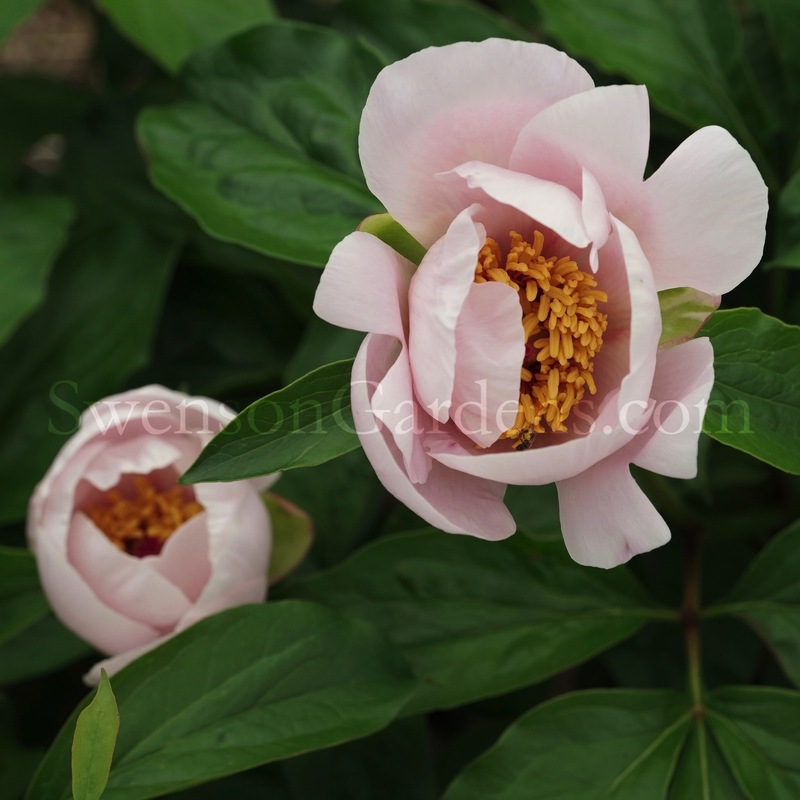 Have a safe trip out here and we can’t wait to see you at Peony Field Days! 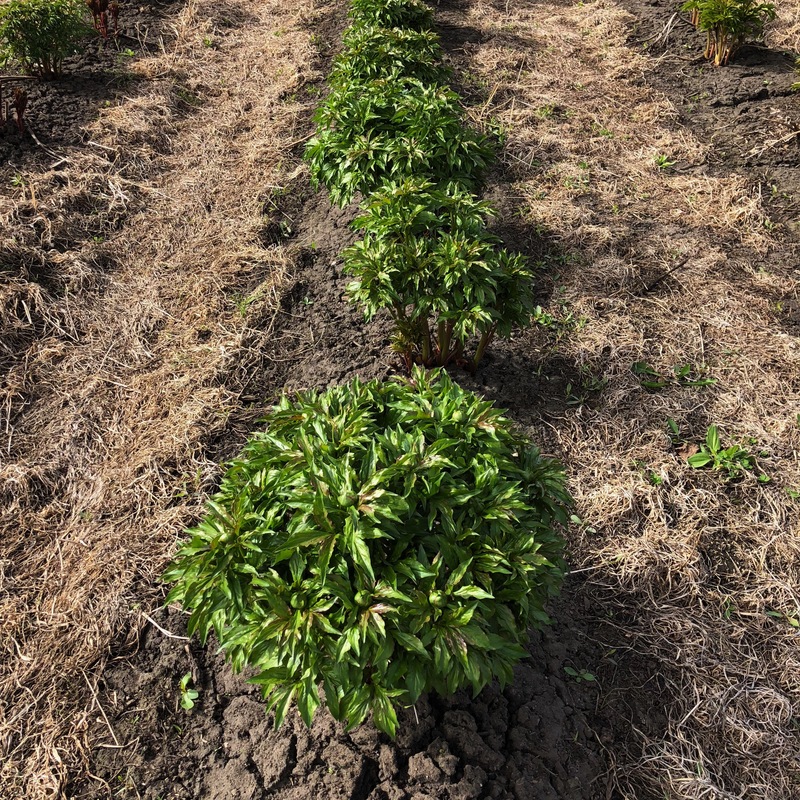 Peony Field Days preparations are in full swing! The storm that came through last evening left us without power for a couple of hours but oh the joy to have about an inch of rain and 20 F degrees drop in temperature. 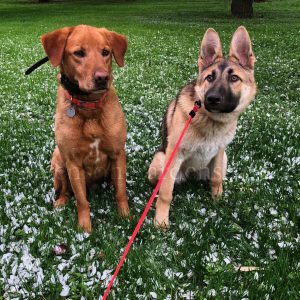 For those of you who are venturing out here on June 1st and/or June 2nd, make sure to check the weather conditions on June 2nd as they are predicting thunderstorms in the afternoon. We will post on blog, Facebook and 763.350.2051 for any cancellations that are weather related. Here are a few of the varieties that started to open up this evening. Red Grace another one of our favorite reds. Chocolate Soldier our favorite dark red. Liberator, one of Saunders tallest reds. Can you find the bumble bee? Salmon Beauty had an visitor, a Tiger Swallowtail, that stayed for a few shots. And yes the first intersectional hybrid peony, First Arrival. As you can see in this pic, the primary bud opened with the secondary still to come. I will try to post more pics tomorrow evening as some varieties are opening quickly due to the prior heat wave and others are still waiting to open. 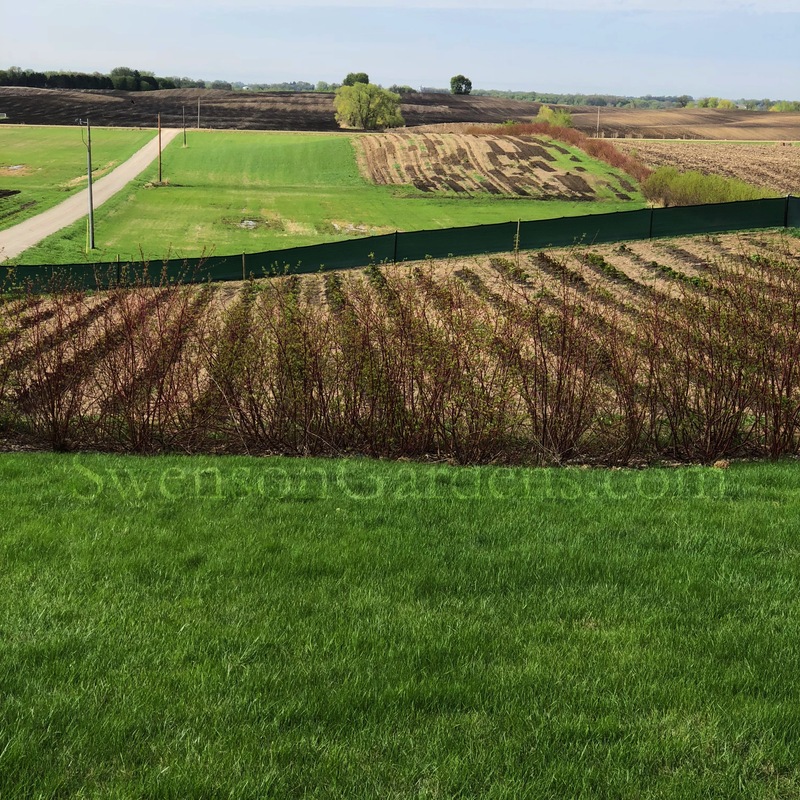 Because we have three different fields open to view and three different micro climates, overall I would say we are at early to mid bloom time in two of the fields. New varieties continue to pop so it is fun to see color in the fields. 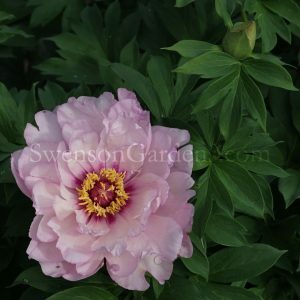 For those of you coming to Peony Field Days, sorry but I need to post this for insurance purposes, Swenson Gardens shall not be held liable for any injury, death, theft and accidents while you are on our property at 10958 70th Street SW, Howard Lake, MN 55349. You are entering and being on our property at your own risk. 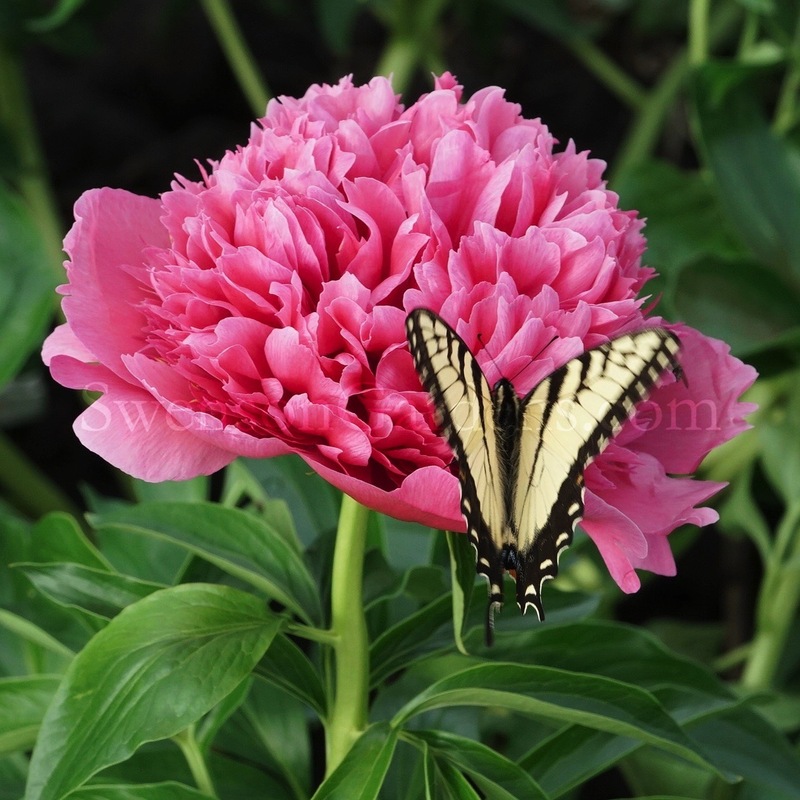 Our farm is for you to enjoy and please be safe while attending Peony Field Days. 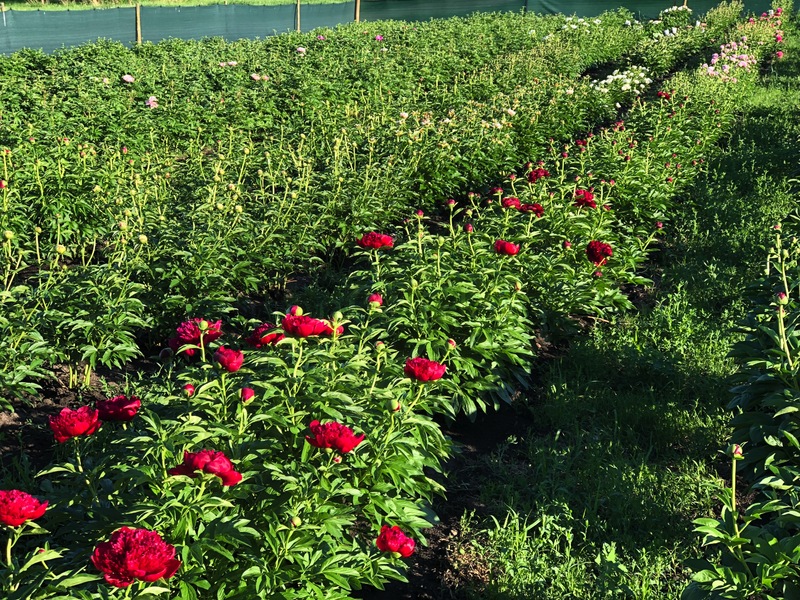 Having you visit our farm is the highlight of the year for us and we are so anxious to visit with you and talk peonies. 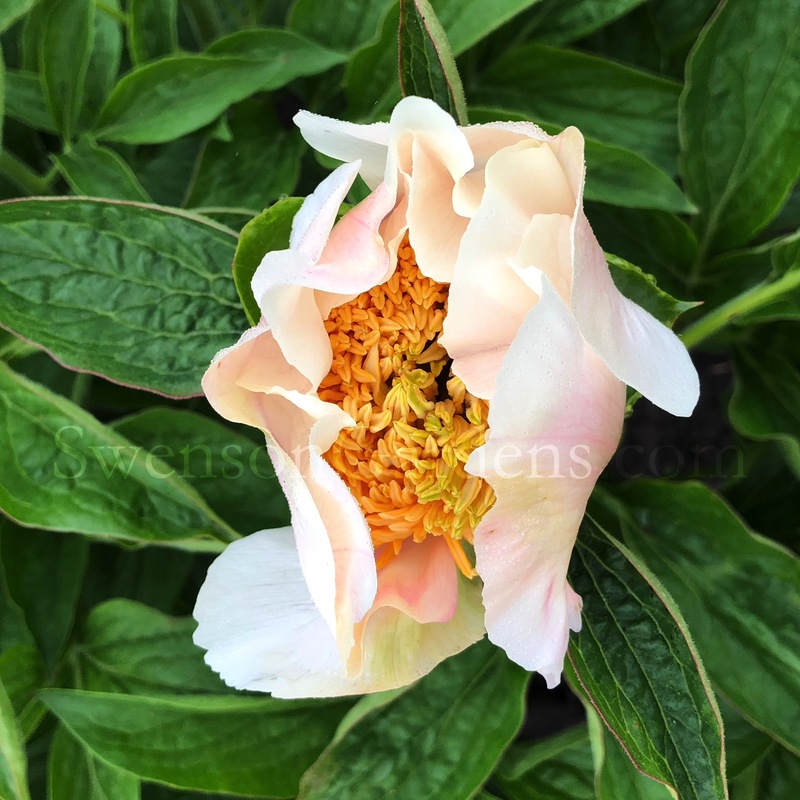 For those of you who follow my blog, you may want to order your peonies online to make sure they are available as we will be selling out of many of the varieties during Peony Field Days. We now have the ability to order online for local pickup so take advantage of that before your favorites are sold out. You can always order more at Peony Field Days! 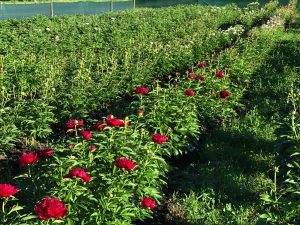 The time has come to announce our 2018, Peony Field Days! What a crazy time this has been going from winter to summer in a couple of weeks. With the extreme heat the last several days and more in the forecast for the rest of this week, we made the decision today to start on June 1st and June 2nd from 9 am to 5 PM. Seems like every spring as of late, something different happens to us with the weather. This year for sure is not exception. Multiple days of 90F+ temperatures have seen blooms here and gone in very short order. Of course for hybridizing and pictures, sunrise to sunset is the norm. So to gauge where we are at today with bloom time, definitely very early to early blooms. 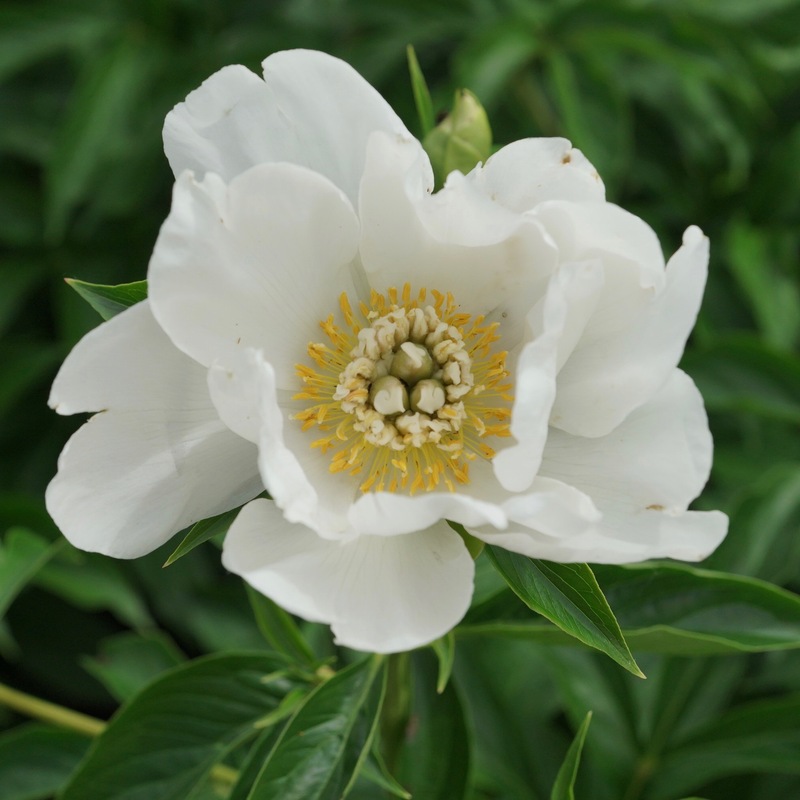 Athena opened up in all her splendor with an array of flares and soft white petals. Lovebirds was close behind with her subtle pink tones that soon will change to an ivory white beauty. Though the reds have not opened yet, one of our favorite’s is Christmas Velvet. He should be in bloom by the end of the week. More information will be forthcoming on our 2018 Peony Field Days so check back again as yours truly needs to get back in the fields for updating pictures. Swenson Gardens would like to thank all the men and women who gave their lives for our freedom. We appreciate their service to our great nation and respect for our flag! As we raise our flag today, please say a prayer of thanks for all those who have lost so much and miss their loved ones during this special day of remembrance. May God richly bless you and your family and friends today for giving your loved one to serve our country. We are eternally thankful! 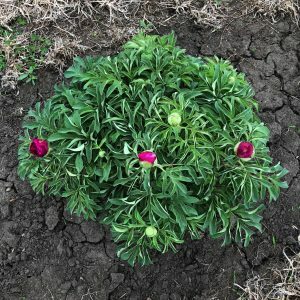 With the warmer temps this past week, the peonies really took off above the ground. 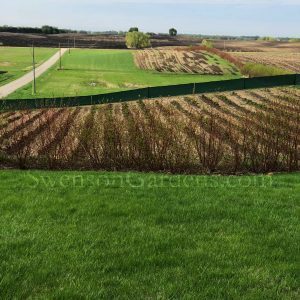 As I mentioned in a post or two last year, we are blessed with multiple growing fields on different soil types and various micro-climates. So in one of our fields that has black dirt (which warms up the fastest) and with its own micro-climate, the winner of the first peony to bloom is ‘Starlight’. 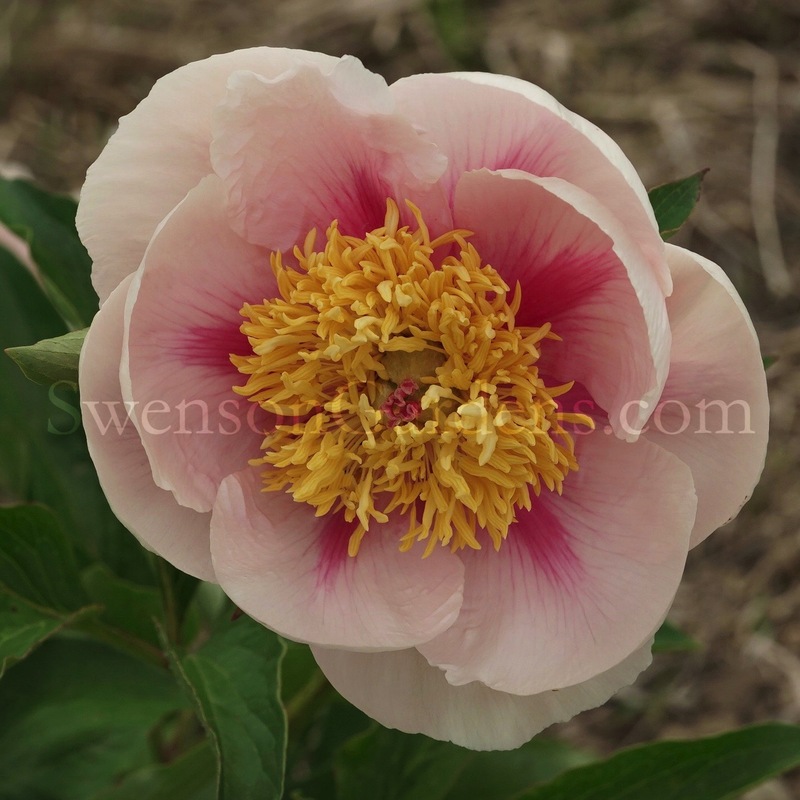 Very strange to have a herbaceous bloom before the tree peonies but oh the joy to see color in this particular field. 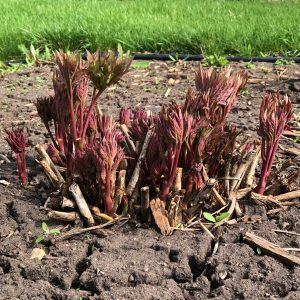 Welcome to our 2018 peony season at Swenson Gardens! Coming in a close second is our sub. species ‘huthii’. Because of the overcast conditions and cooler temps, ‘huthii’ did not open all the way so that is why second place is awarded. 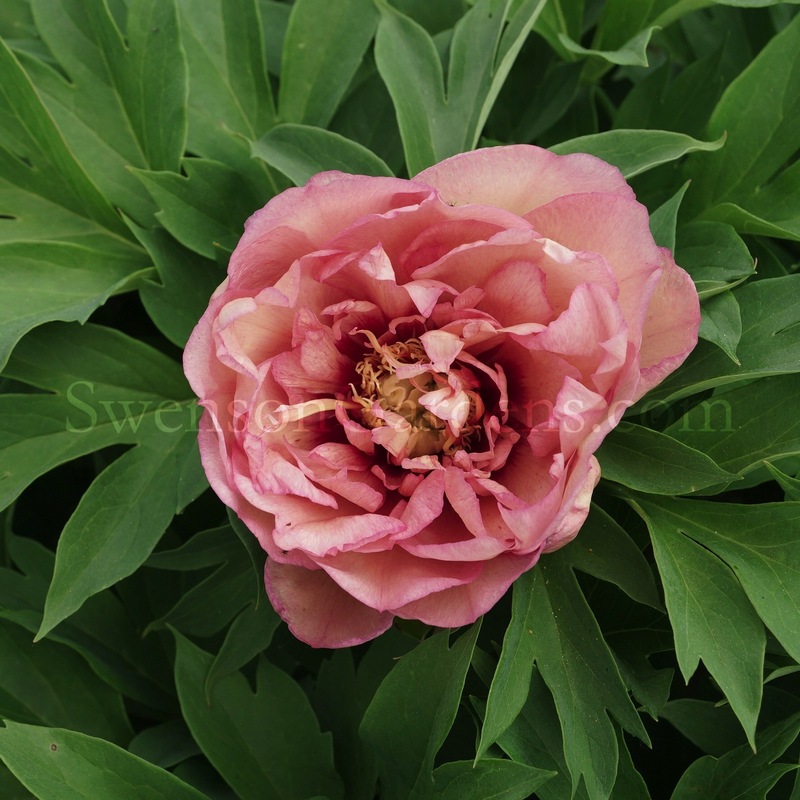 Stay tuned for an upcoming announcement regarding Peony Field Days in the very near future. We are waiting for another one of our fields to progress more. 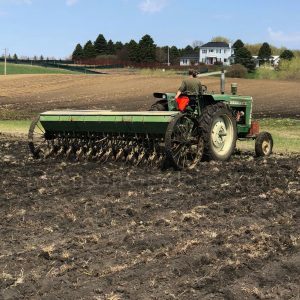 That field is mostly clay and loam soil so it takes a bit longer to warm up. With above normal temps forecasted next week, we should be able to announce the dates for June. 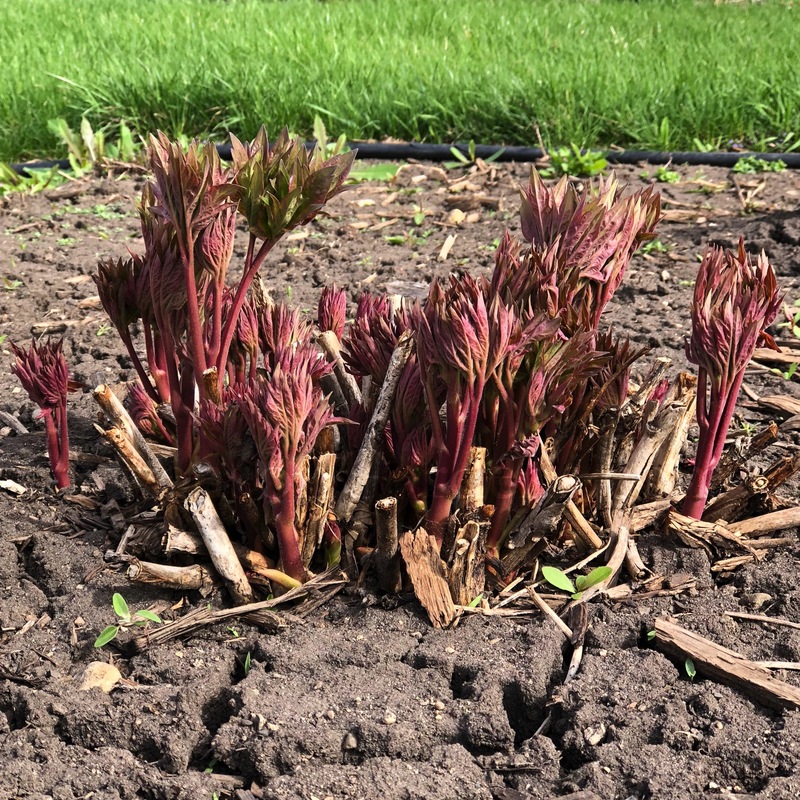 Last fall we started to transition peonies back to the east of our driveway where many of you have walked a few years ago. 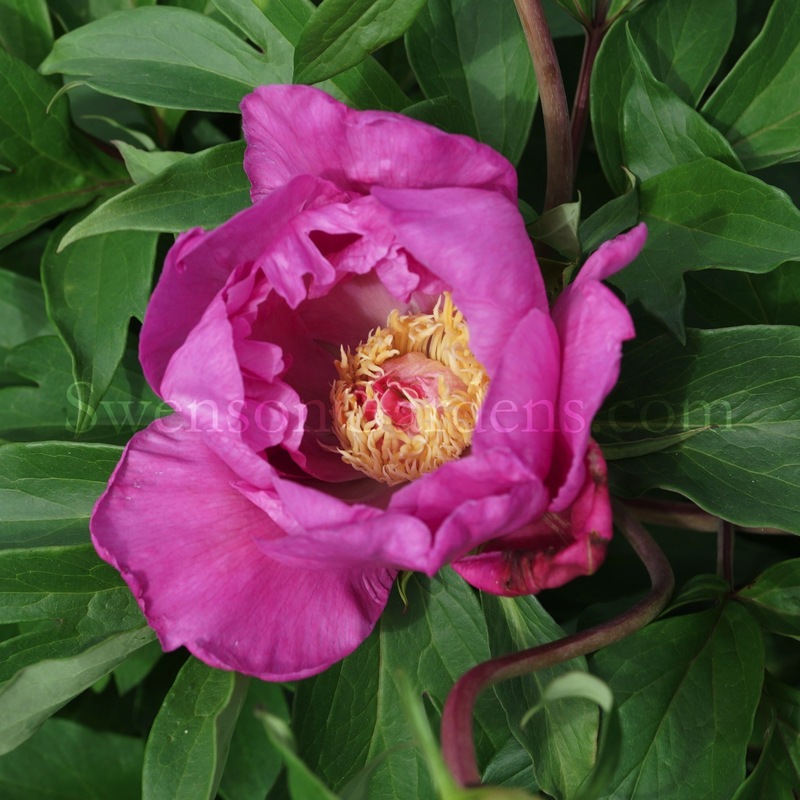 The field west of our driveway was mainly used for filling peony orders but there are still many varieties left to show. We are also filling in the south side of that field as a display area that will show an amazing palette of color in two years. For those of you who have never been to Peony Field Days, we are NOT a nursery with cement or gravel walkways. You are actually walking through some of our production fields. 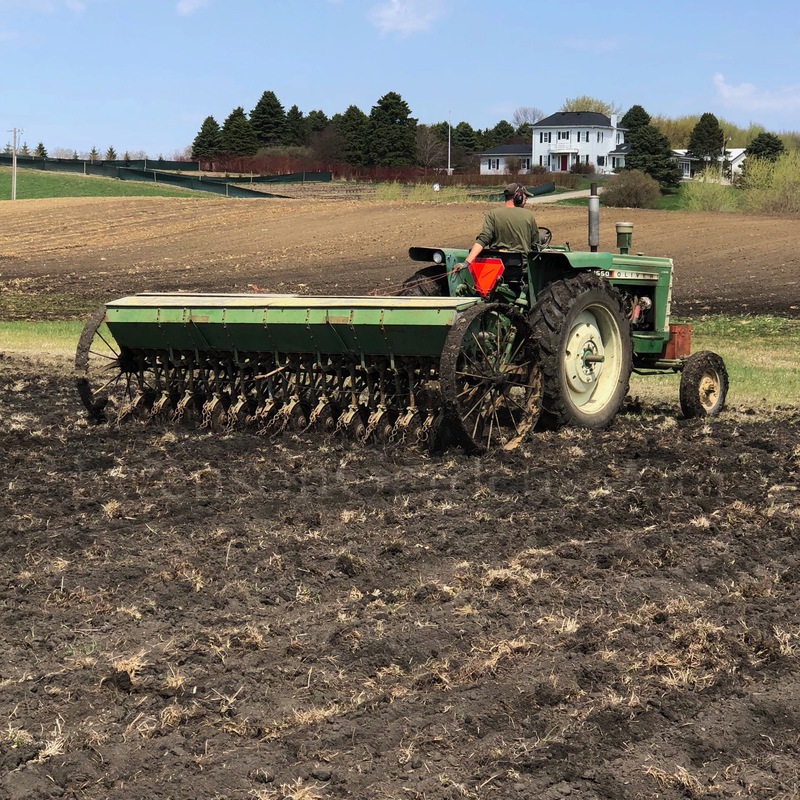 Yes we do plant an annual cover crop between the rows, but for those of you who have been out here after rain and storms, it can be a tad muddy in areas. 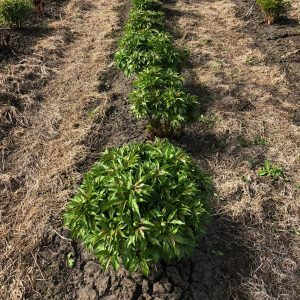 Because our fields change every year, we try our best to make it visually appealing and most of all informative and educational on how to grow peonies without chemicals as we do at this large of a scale. 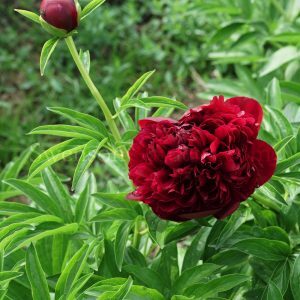 Oh and you will also see a plethora of peonies that are not found anywhere else in the US and for that matter in the world! The sights, smells and sounds sure have blossomed this week on the peony farm. Crab apples and apple trees are at their peak bloom and oh what a sight and smell they present. Having a camera ready with Heidi going crazy trying to catch falling petals from a crab apple tree did not turn out so I had them sit in the next sequence of pictures to at least I could try to catch the moment of chaos. 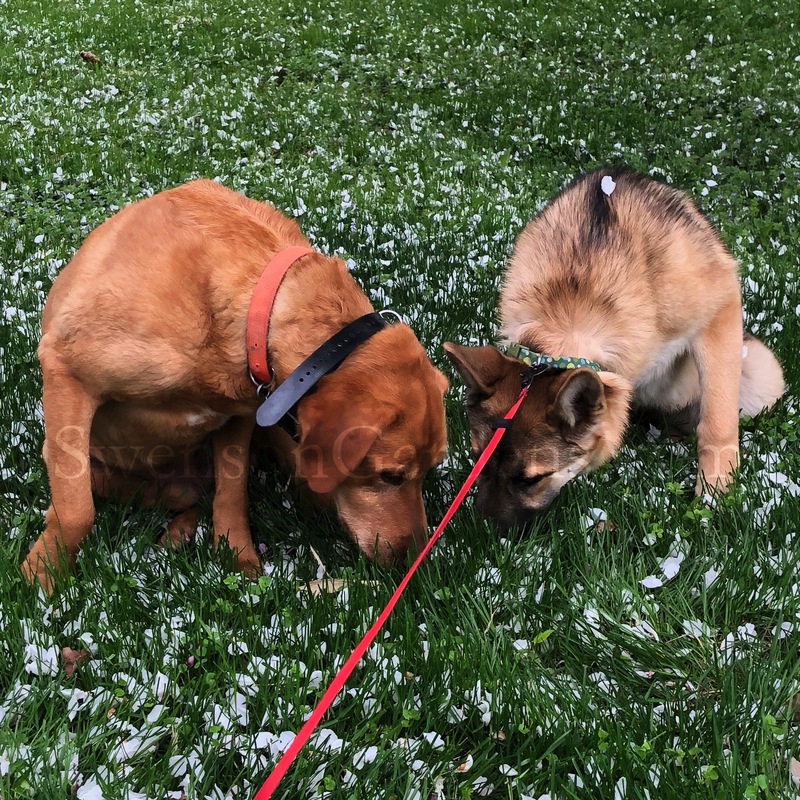 Thankfully this is not snow on the ground or hail but the sweet remaining fragrance of the crab apple petals. I should bring another person with me so I could have photographed Heidi jumping quite high in the air trying to catch the petals. 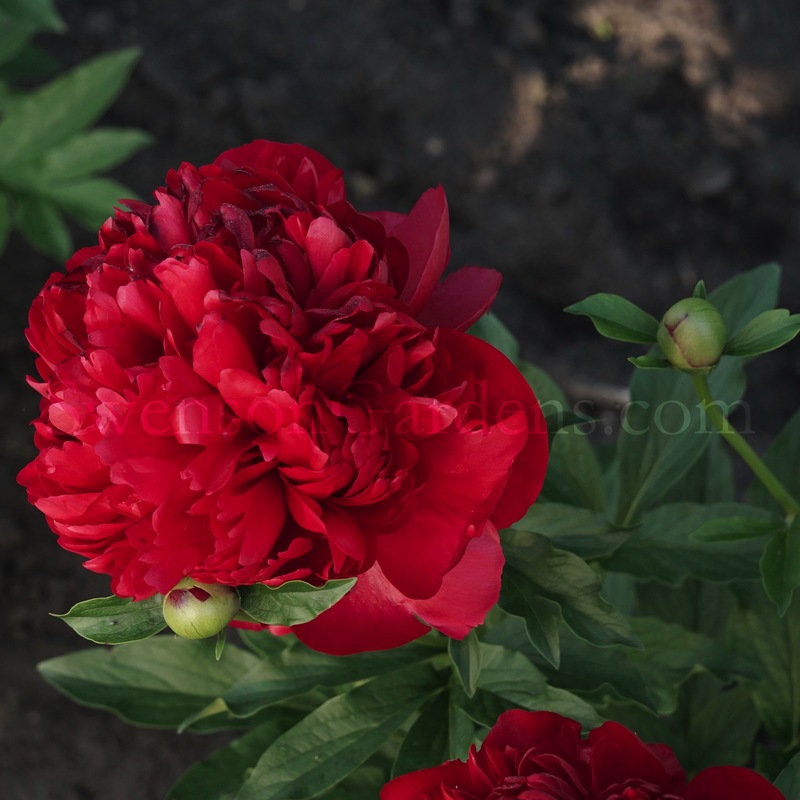 Happiness abounded with these antics on the peony farm this morning!